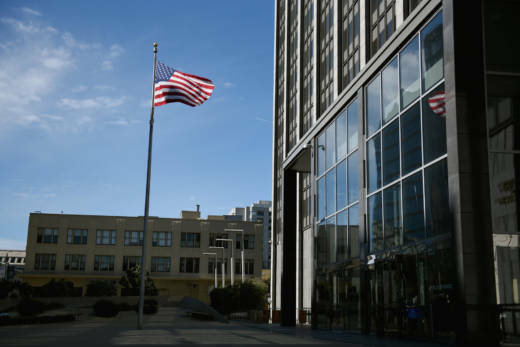 A 23-year-old Oakland man pleaded guilty to a terrorism-related charge in federal court Wednesday. Amer Sinan Alhaggagi changed his plea with no assurance from prosecutors that it would shorten his sentence, an unusual move that leaves open a broad range of punishments as the case proceeds to sentencing. Alhaggagi was arrested in late 2016 on an identity-theft charge. But he was later indicted for attempting to provide material support to a foreign terrorism organization — the Islamic State, or ISIS. Federal prosecutors described Alhaggagi's alleged statements online and to an undercover FBI agent at closed hearing in 2016 that was unsealed last summer. Alhaggagi allegedly chatted about bombing a gay club in San Francisco, mixing strychnine with cocaine and distributing it at nightclubs, starting a fire in the Berkeley Hills and planting bombs at dorms on the UC Berkeley campus. "What he said was all complete rubbish. He didn’t intend to do any of it," his defense attorney, Mary McNamara, said outside of court on Wednesday. "This is really a case about what the appropriate sentence should be," she said. "Here is a young guy who is immature, said some stupid things online. The FBI sent their best people sent out their best people to try and get a sting operation going. He wouldn’t do any of the things that they asked him to do." McNamara said that while "he said some foolish things online," Alhaggagi's charges aren't related to any of those statements. Instead, the charge of attempting to provide support to ISIS stems from setting up a handful of social media accounts for people he'd met in an online chat room, according to the indictment in the case. Alhaggagi doesn't dispute that he set up the accounts, and McNamara said there is no defense to the broad U.S. law against supporting foreign terrorist organizations. "The statute itself, we don’t have a defense to it," she said. "You can give a dollar of support to ISIS — you’re guilty. You can provide humanitarian support to ISIS — you’re guilty. You open up a social media account when somebody asks you — you’re guilty. This is what’s happened in the country since 9/11." Alhaggagi also allegedly talked about using fraudulent credit cards and checks to fund the effort, and he faces other charges related to identity theft and fraud. In court Wednesday, he wore an Alameda County jail uniform, which was partially obscured by his hair grown down to his mid-back. The courtroom was packed with supporters, from his family and from the broader Yemeni community in the Bay Area. He spoke little during the hearing, answering "yes" to Judge Charles Breyer's questions about whether he understood the potential consequences of changing his plea. But in a filing his defense team made public after the hearing, Alhaggagi described his activity in online chats in late 2016. He said he participated in a "pro-ISIS chat" translated to "Allah is with those who endure," where he "engaged in the trolling behavior of falsely reporting users who had blocked me ... as Shiites." "By doing so, I hoped that Sunni ISIS sympathizers would in turn block these users," Alhaggagi wrote, adding that he also re-posted pro-ISIS messages in the chat. "I believe that it was due to my posting of the pro-ISIS messages and my naming people as Shiites that I was approached by the two individuals who asked me to set up social media accounts," the statement says. "From the manner in which they approached me and the language they used, I believed them to be supporters of ISIS." The actual status of the two people for whom Alhaggagi would go on to open Twitter, Facebook and Gmail accounts is in dispute. Federal prosecutor S. Waqar Hasib said in court Wednesday that one of them is "a real, live member of ISIS." McNamara described that person as a 16-year-old high school student in Iraq. I deeply regret what I have done. I should not have opened the accounts. And, since the time that I was charged, I have seen evidence that some of the Twitter accounts that I opened were in fact used to distribute news and other material about ISIS. I apologize to the FBI and to the Court. I also want to tell my family — my mother, my father, my sisters and my brother and the Yemeni community — how much I regret the damage that I have done to them all. The maximum punishments for all the charges to which Alhaggagi pleaded guilty add up to a 47-year prison sentence. He could be sentenced to a minimum two years in prison because the identity theft charge mandates that punishment, McNamara said. She said the defense plans to call an expert witness on radicalization at Alhaggagi's sentencing hearing, which scheduled for November. "I think the testimony will show that he's not radicalized, he's not violent," McNamara said after the hearing. "He's not somebody who believes in ISIS. He doesn't support them. He actually finds their conduct abhorrent. He is somebody whose an ordinary American kid who just had a big mouth."